Brazil began their two game visit to England with a narrow 1-0 victory over Uruguay. 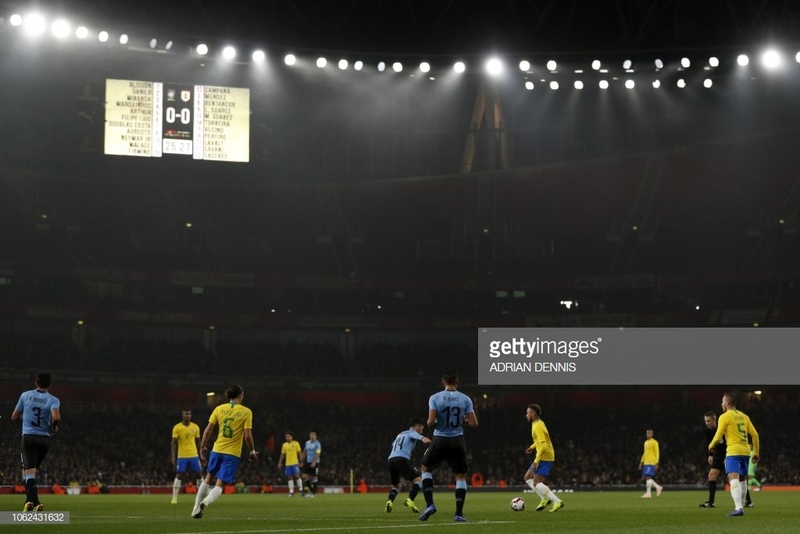 Brazil defeated a valiant Uruguay 1-0 at the Emirates thanks to a second-half Neymar penalty. Brazil started this South American Classico on top, and it was their star man Neymar who was pulling the strings early on. The first chance come for Brazil when a free-kick just outside the box from Douglas Costa was well saved and turned away for a corner by Martin Campana in Uruguay goal, who then easily gathered the resulting corner. Brazil then thought they had taken the lead after 11 minutes when Neymar turned in a brilliant driven cross by Filipe Luis but was denied by the assistant's flag. Neymar was really strutting his stuff out there, to the delight of the crowd. He saw another effort agonisingly sail over the crossbar. Uruguay's first real chance of the game took little over 20 minutes to materialise. Captain Luis Suarez, found himself some space at the top of the Brazil box and his powerful effort was tipped over by Alisson. The rest of the half was nip and tuck with very few clear-cut chances for either side. Uruguay did have a last-second chance in the first half when Suarez played a beautiful cross-box pass to Edinson Cavani whose effort was well saved by Alisson. The first chances of the second half fell to Uruguay. One came from a free-kick when Suarez had an effort which was denied by Allison and went out for a corner, and from that corner Matias Vecino had a header go just over. Brazil were applying a decent amount of pressure on the Uruguay defence but the combination of Bruno Mendez and Martin Caceres, kept them at bay. Again it was Neymar having Brazil's best chances, as in the 65th minute, he was able to dance his way through that resolute Uruguay defence but his effort was gathered at the second attempt by Campana. Brazil were awarded a controversial penalty by English referee Craig Pawson with little over 15 minutes left on the clock when substitute Richarlison was adjudged to be fouled in the box. Initially, Pawson did not award a penalty but his mind was changed and up stepped the talisman Neymar to send Campana the wrong way and give Brazil the lead. Uruguay had a last-minute free-kick when Luis was penalised for handball and it was down to captain Suarez to deliver but it was well cleared by Miranda in the Brazil defence. That proved to be the only goal in a very feisty encounter and the word friendly doesn't apply when these two meet. Six Uruguay players were booked and two Brazil players were also cautioned which shows the nature of this fixture. Neymar really showed why he is one of the best players in the world tonight. His silky moves cause nightmares for Mendez and Caceres at the back and if it wasn't for some excellent last ditch defending from the aforementioned, the PSG man could have had scored more. Uruguay are the yang to Brazil's yin. Brazil play very skillful football, which is more pleasing on the eye, while Uruguay are more practical in their play, with very functional football. Playing a naturally central player like Cavani on the right wing, showed that they were looking for brute force than skillful intrigue. Aside from the action on the pitch, it is really good to see matches like this played in Europe for the fans to come and see. This sort of event brings into question whether club football should be played abroad to maximise exposure for fans but that is a whole different kettle of fish.